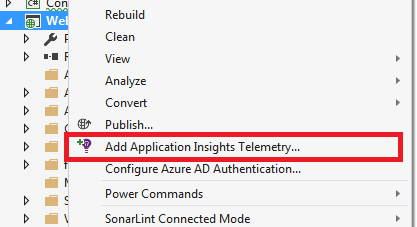 Application Insights is a performance monitoring service, created by Microsoft and available on Azure. It gives you space to store the performance metrics and logs of your application (1GB for free! ), as well as functionalities to search and manage them. In this post I am not going to present you the whole platform – Microsoft already did it in the Azure documentation, but rather focus on an element of the log collection, named dependency calls tracking. I did some analysis on the Application Insights libraries, and decided to publish my findings, in the hope that the results might interest some of you too. Dependency calls are requests, which your application makes to the external services (such as databases or REST services). When this telemetry type is enabled, all the dependent actions form a timeline within the scope of the parent action. Using this timeline we may easily verify whether the delay in our application is caused by an external service, or the application itself. Let’s analyze in detail how this data is collected. The “Dependency diagnostics” row is the one we will investigate further. As you can see the official docs state that the run time dependency diagnostics provides more details about the calls, and it works for all versions of .NET, whereas the build time dependency diagnostics is supported only on .NET 4.6+ and lacks some details. If you are surprised, don’t worry – I was too, but everything will be clear soon. You may later check the OnEventWritten methods in both those listeners to see how the received events are processed. As you see, the dependency calls instrumentation at build time is based on ETW events. Let’s analyze what happens at run time. You may be now wondering which instrumentation type you should use in your app. If your app runs on .NET older than 4.6 and you want to use dependency diagnostics, you don’t have a choice, but to install the agent on the server. 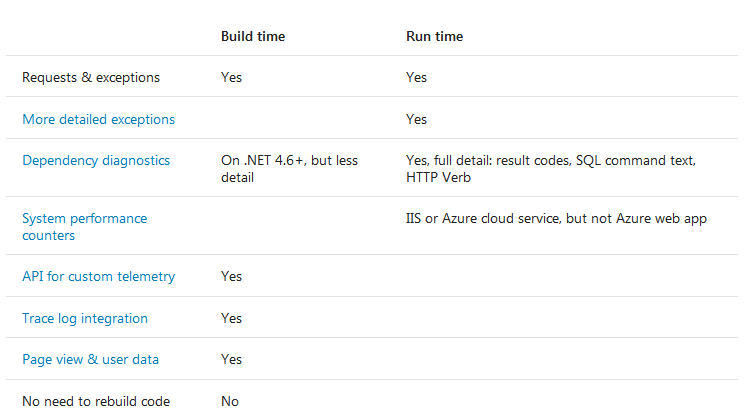 If your app uses .NET 4.6+ you may configure only the build time instrumentation. The profiler way (run time instrumentation) generates more overhead compared to the ETW way (build time instrumentation). Thus, I would recommend starting with the build time instrumentation, and enable the run time instrumentation only if you need more details. Finally, if you have both types of instrumentation enabled, the profiler way will take precedence.